MudBuster is a European cleaning product introduced into Australia by 2015 BSB champ and WSBK rider Josh Brookes. Brookes is a self-confessed clean freak and found the product while racing overseas, it worked so well he decided to bring it to Australia. MudBuster’s road bike cleaner concentrate and degreaser is a blend of biodegradable liquid raw materials specifically formulated for the cleaning all types of road bikes. There are no solid particles (no matter what size) to drop out or to be left behind after cleaning and rinsing, therefore leaving exceptionally clean uncontaminated surfaces. MudBuster washes, waxes and removes oil, grease and grime from your road bike, all in one application. 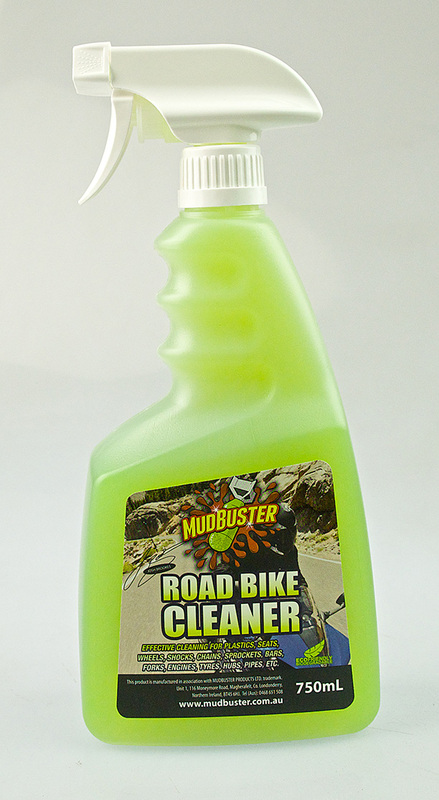 MudBuster Road Bike Cleaner activates when mixed with air and water. Simply Give your bike a hose first, spray on MudBuster, scrub and hose off. There are about 40 stores across NSW and Victoria which stock the MudBuster range. It’s simply a case of asking your local bike shop to stock it for you.